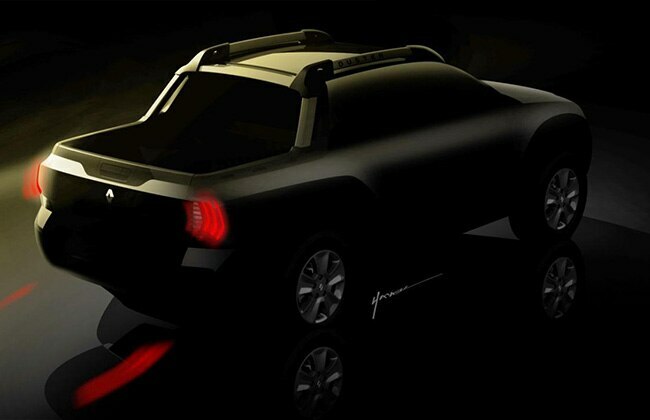 Jaipur: The French car giant, Renault, will be debuting the pickup version of Duster in the upcoming Buenos Aires Motor Show in Argentina on June 18, 2015. The vehicle is tagged as ‘Sports Utility Pickup’ by the company and inherits all the good attributes of Duster with some new add-ons. The vehicle will come with a fresh face and graceful interiors. The reason this reveal is important for India is that it will give us an idea about the upcoming update in Duster as it might receive a similar facelift, both on the exteriors and interiors. The teaser hints towards an all new front face, with dual projector like headlamp, a new bumper with skid plate, possibly a new grill-entirely different from the current car, a new rear with probably LED tail light cluster and bumper. Other than this, the cockpit too is expected to change drastically over the current car and rumours are that Renault might offer two more seats as an option for what is currently the boot of the car. As far as the Indian launch of the facelift is concerned, Renault might bring it in 2016 Indian Auto Expo.